The territorial marking fluid of the male Bengal tiger, Panthera tigris, consists of a mixture of urine and a small quantity of lipid material that may act as a controlled-release carrier for the volatile constituents of the fluid. Using gas chromatography and gas chromatography–mass spectrometry, 98 volatile compounds and elemental sulfur were identified in the marking fluid. Another 16 volatiles were tentatively identified. The majority of these compounds were alkanols, alkanals, 2-alkanones, branched and unbranched alkanoic acids, dimethyl esters of dicarboxylic acids, γ- and δ-lactones, and compounds containing nitrogen or sulfur. Several samples of the marking fluid contained pure (R)-3-methyl-2-octanone, (R)-3-methyl-2-nonanone, and (R)-3-methyl-2-decanone, but these ketones were partly or completely racemized in other samples. The γ-lactone (S)-(+)-(Z)-6-dodecen-4-olide and the C8 to C16 saturated (R)-γ-lactones and (S)-δ-lactones were present in high enantiomeric purities. The chiral carboxylic acids, 2-methylnonanoic acid, 2-methyldecanoic acid, 2-methylundecanoic acid, and 2-ethylhexanoic acid were racemates. Cadaverine, putrescine, and 2-acetylpyrroline, previously reported as constituents of tiger urine, were not detected. 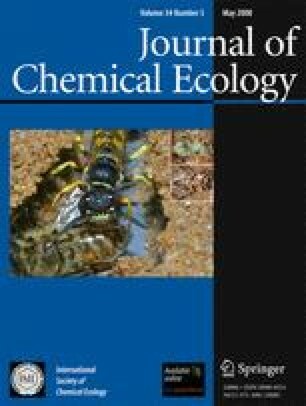 The dominant contribution of some ketones, fatty acids, and lactones to the composition of the headspace of the marking fluid suggests that these compounds may be important constituents of the pheromone. Although it constitutes only a small proportion, the lipid fraction of the fluid contained larger quantities of the volatile organic compounds than the aqueous fraction (urine). The lipid derives its role as controlled-release carrier of the chemical message left by the tiger, from its affinity for the volatiles of the marking fluid. Six proteins with masses ranging from 16 to 69 kDa, inter alia, the carboxylesterase-like urinary protein known as cauxin, previously identified in the urine of the domestic cat and other felid species, were identified in the urine fraction of the marking fluid. The online version of this article (doi: 10.1007/s10886-008-9462-y) contains supplementary material, which is available to authorized users. The support of the University of Stellenbosch, the Foundation for Research Development, Pretoria, and the Tygerberg Zoo, Cape Town, is gratefully acknowledged.